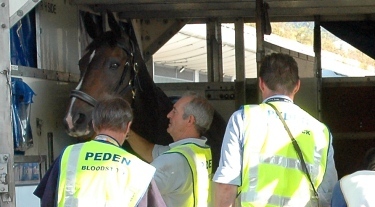 Peden Bloodstock prioritise the Welfare & Safety of your horse throughout their journey. All of our shipments are accompanied by Professional Flying Grooms. Our flying grooms are excellent horsemen having had many years of experience in the equestrian world and working with horses in the air. Not only do they have the capability to handle all breeds and temperaments of horse but they have extensive knowledge of the different models of aircraft, the horse stalls and the constantly fluctuating procedures at airports all over the world. All Peden Bloodstock’s flying grooms are members of the ATA (Animal Transport Association) and hold certificates of the NPTC (National Proficiency Test Council). Their sole responsibility is to take care of the horses during the flight; accompanying your horse throughout the airport and flight process – from the minute they arrive at the airport to the minute they depart the airport of destination. Should you also require your horse to be accompanied on the truck to and from the airport our professional flying grooms will be at your disposal ensuring an experienced horseman is present with your horse from stable door to door. For decades Owners, Trainers and National Federations have trusted Peden Bloodstock’s Flying Grooms to accompany their most precious horses and deliver them professionally and safely to competitions, races and new homes around the world.